"Xiva" redirects here. For the Spanish town, see Chiva, Valencia. Khiva (Uzbek: Xiva/Хива, خىۋا; Persian: خیوه‎, Xīveh; alternative or historical names include Kheeva, Khorasam, Khoresm, Khwarezm, Khwarizm, Khwarazm, Chorezm, and Persian: خوارزم‎) is a city of approximately 90,000 people located in Xorazm Region, Uzbekistan. According to archaeological data, the city was established in the beginning of the Christian era. It is the former capital of Khwarezmia and the Khanate of Khiva. Itchan Kala in Khiva was the first site in Uzbekistan to be inscribed in the World Heritage List (1991). The astronomer, historian and polymath, Al-Biruni (973-1048 CE) was among several Muslim scholars born here. A traditional story attributes the name to one of the sons of Prophet Noah(AS): "It is said that Shem(AS) [from whence the word Semitic is derived], after the flood, he found himself wandering in the desert alone. Having fallen asleep, he dreamt of 300 burning torches. On waking up, he was pleased with this omen, he founded the city with outlines in the form of a ship mapped out according to the placement of the torches, about which he had dreamt. Then Sim dug the 'Kheyvak' well, the water from which had a surprising taste. It is possible to see this well in Ichan-Kala (an internal town of Khiva City) even today." A third proposal is that the name comes from the word Khwarezm, altered by borrowing into Turkic as Khivarezem, then shortened to Khiva. In the early part of its history, the inhabitants of the area were from Iranian stock and spoke an Eastern Iranian language called Khwarezmian. 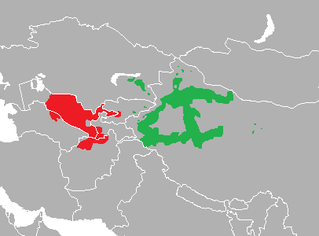 Subsequently the Iranian ruling class was replaced by Turks in the 10th century A.D, and the region gradually turned into an area with a majority of Turkic speakers. The earliest records of the city of Khiva appear in Muslim travel accounts from the 10th century, although archaeological evidence indicates habitation in the 6th century. By the early 17th century, Khiva had become the capital of the Khanate of Khiva, ruled by a branch of the Astrakhans, a Genghisid dynasty. In 1873, Russian General Konstantin von Kaufman launched an attack on the city, which fell on 28 May 1873. Although the Russian Empire now controlled the Khanate, it nominally allowed Khiva to remain as a quasi-independent protectorate. Following the Bolshevik seizure of power after the October Revolution, a short lived Khorezm People's Soviet Republic was created out of the territory of the old Khanate of Khiva, before its incorporation into the USSR in 1924, with the city of Khiva becoming part of the Uzbek Soviet Socialist Republic. Khiva is split into two parts. The outer town, called Dichan Kala, was formerly protected by a wall with 11 gates. The inner town, or Itchan Kala, is encircled by brick walls, whose foundations are believed to have been laid in the 10th century. Present-day crenellated walls date back to the late 17th century and attain the height of 10 meters. Kalta Minor, the large blue tower in the central city square, was supposed to be a minaret, but the Khan died and the succeeding Khan did not complete it. ^ Nashriyoti, Davr (2012). Khiva: The City and the Legends. Tashkent, Uzbekistan: DAVR NASHRIYOTI LLC. p. 2. ISBN 9789943339262. A Ride to Khiva, Frederick Burnaby, (OUP, 1997. First published 1876). A Carpet Ride to Khiva, C. A. Alexander, (London, 2010). Journey to Khiva, Philip Glazebrook, A Writer's Search for Central Asia, (London, 1992). Wikimedia Commons has media related to Khiva. Urgench is a city in western Uzbekistan. The population of Urgench on April 24, 2014 was approximately 150,110, an increase from 139,100 in 1999. It is the capital of the Khorezm Region, on the Amu Darya River and the Shavat canal. 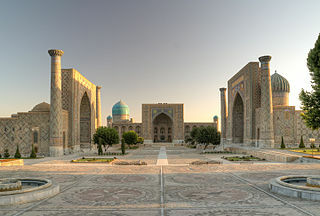 The city is situated 450 km (280 mi) west of Bukhara across the Kyzylkum Desert. Ichan Kala is the walled inner town of the city of Khiva, Uzbekistan. Since 1990, it has been protected as a World Heritage Site. The Khanate of Khiva was an Uzbek state that existed in the historical region of Khwarezm in Central Asia from 1511 to 1920, except for a period of Afsharid occupation by Nadir Shah between 1740 and 1746. The Khans were the patrilineal descendants of Shayban (Shiban), the fifth son of Jochi and grandson of Genghis Khan. Centred in the irrigated plains of the lower Amu Darya, south of the Aral Sea, with the capital in the city of Khiva, the country was ruled by an Uzbek Turkic tribe, the Khongirads, who came from Astrakhan. 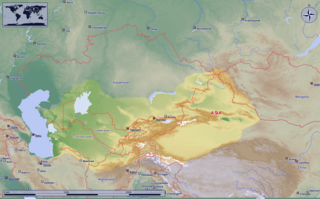 It covered present western Uzbekistan, southwestern Kazakhstan and much of Turkmenistan before Russian arrival at the second half of the 19th century. Mangystau Region is a region of Kazakhstan. Its capital is Aktau, which has a population of 183,350 (2017); the entire Mangystau Region has a population of 674,963 (2018). 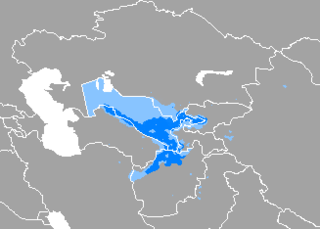 The Karluk languages are a sub-branch of the Turkic language family that developed from the varieties once spoken by Karluks. Gurlen or Gurlan is a town and seat of Gurlen District in Xorazm Region in Uzbekistan. It is located near the border with Turkmenistan in western Uzbekistan, 42 kilometres (26 mi) north-west of Urgench, north of Shovot, and south of the Amu Darya river. Gurlen is a major centre for cotton production, and rice and yams are also significant other crops.